With the PRO-TREAD Mobile App, carriers are able to give drivers options for when, where and how to complete training. 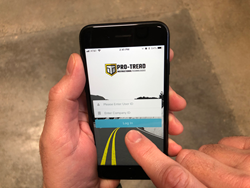 Instructional Technologies Inc. (ITI), providers of training solutions for the transportation industry including PRO-TREAD online training content and the Sentix training automation platform, introduced here today the new PRO-TREAD Mobile App. The announcement was made during the annual Safety, Security, and Human Resources National Conference and Exhibition of the ATA Safety Management Council (SMC). Founded in 1995 and based in Vancouver, Washington, Instructional Technologies Inc. (ITI) is the leading provider of online training to the transportation industry. The company’s commitment to training is based on the principles of mastery learning, accurate and automated record keeping, and up-to-date information that ensure personnel have been effectively trained and detailed records kept. ITI makes fleets and warehouses safer and more profitable through its PRO-TREAD library of more than 120 standard training courses that blend engaging content with real-world, how-to scenarios, and its Sentix platform that automates the day-to-day administration of an online training program in addition to integrating with transportation management and back office systems. Transportation and logistics companies choose ITI because of its automated learning management system, custom training capabilities, flexible lesson methodologies, and engaging 3D animations that improve retention, ensure subject matter mastery and lower the total cost of training. For more information, please visit http://www.instructiontech.net.